Hi, I’m Kari, creator of Keep it Simple, DIY. I’m a lifestyle blogger with an MBA who blogs about finance, Home & DIY, blogging, and more. My main motto is that if you just try, you will succeed. The key is to Keep it Simple. Hello again! It’s been a few month’s since I’ve really been involved with my blog. At the beginning of September, I did a lot of behind the scenes. My main focus was switching from Blogger to WordPress.com so my site would look more aesthetically pleasing. Now, the site is fully transferred, except for losing all of the stats…Boo :(, so I figured I would give you all an update. It’s been an interesting mind game to see views in the single digits for a day since I was used to being in the double digits each day, but my stats are starting to come back up on the blog side. 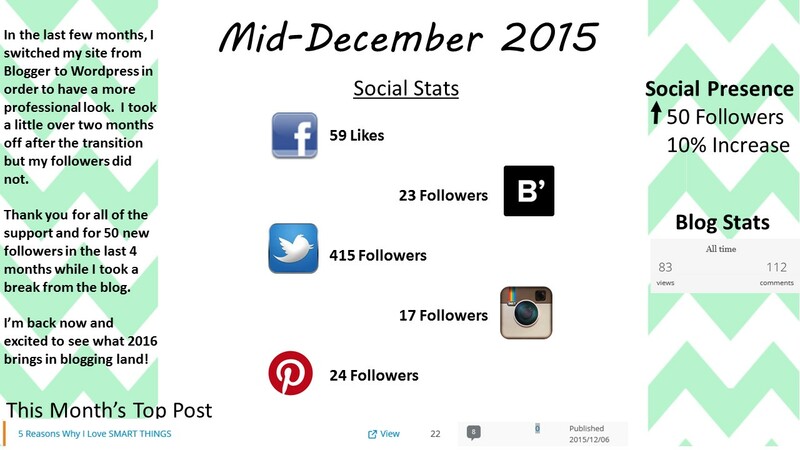 What I am very excited about is that my social presence has grown by 10% in the last third of 2015! Most of while I was taking a break from my blog. The support is truly appreciated and it has re-motivated me to get back into the game! I’m wondering where you got the cool info graphic to show your data? Also I wrote own update this week as well… Maybe we can connect in the blogosphere! I’d like that! I actually created the graphics piece by piece in PowerPoint. I copied a background that I found in google then added each social network individually into the image. A lot of manual work but it’s super easy! I too recently made the switch from Blogger to WordPress and am still working on some small things like making my posts SEO-friendly and whatnot. Easy DIY Bathroom Remodel You Can Do Too! COPYRIGHT © 2017 KEEP IT SIMPLE, DIY. ALL RIGHTS RESERVED.